Environmentalists Split Over Need For Nuclear Power One former anti-nuke activist says the world can't afford to dismiss nuclear power, if we're to rein in global warming. Nuclear plants provide a more reliable energy supply than wind or solar, he says, and without the high carbon emissions that fossil fuels produce. California is regarded as the leading state when it comes to addressing climate change. But in 2012, according to analysts at Rhodium Group, California's carbon emissions actually increased more than 10 percent, bucking the national trend of decreases. That's in large part because California shut down one of its few remaining nuclear power plants. That rise in carbon emissions underscores the huge impact nuclear power can have in efforts to combat climate change. Armond Cohen, executive director of the Clean Air Task Force, cites the shutdown of the San Onofre Nuclear Generating Station as he explains why he has reluctantly shifted from being an anti-nuclear activist to someone who now argues that we can't afford to dismiss nuclear power. Cohen says authorities did the right thing when they shut down the troubled and aging nuclear plant near San Diego. But he's not happy to see California lose a major source of low-carbon energy. San Onofre produced as much carbon-free energy as all the wind power installed in California to date. So it's going to be a pretty heavy lift to replace all that nuclear with low-carbon energy. "San Onofre produced as much carbon-free energy as all the wind power installed in California to date," Cohen says. "So it's going to be a pretty heavy lift to replace all that nuclear with low-carbon energy." As a lawyer in the 1980s, Cohen fought against the Seabrook nuclear power plant in New Hampshire. But he has since become a grudging proponent of nuclear power, as he looks at the world from a perspective of trying to stop global warming. The world's demand for energy is likely to double or triple in the next few decades. And while wind and solar power should be expanded as fast as they can, Cohen says, he is just plain worried about how quickly they can grow from their niche status today. It's a question of scale. 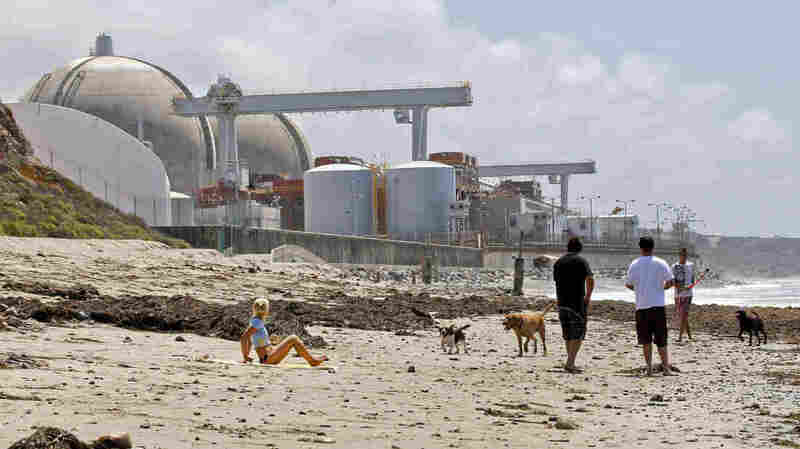 "If you drive by the San Onofre site, you see two cooling towers sitting on a few acres of property," Cohen says. "Think about that and think about the tens of thousands of wind turbines that equal that same amount of energy. And then you get what I'm talking about, associated with the scalability problems [of] renewable energy." Cohen points to a recent study that looked at what it would take for California to reduce carbon dioxide emissions by 80 percent by 2050. It concluded that renewable sources are an important element; but the demand is vast if the state is to convert all its vehicles and the heating of homes from fossil fuels to clean electric energy. A state-funded study by the California Council on Science and Technology concludes that nuclear power would also need to be a big part of the state's response — providing one-third to two-thirds of the energy. "I think you can do it all with renewable energy," says Jane Long, who co-authored that study. "[But] just how long will it take? Can you do it by 2050?" Her study found renewables couldn't meet that deadline, but nuclear power could. That would require bringing the nuclear industry back to its once-rapid pace of construction — building a nuclear plant every year, starting in 2020. Right now that idea isn't just unpopular; it's downright illegal in California. The state has banned new nuclear plants until there's a permanent home for the waste. And Mark Jacobson at Stanford University says that's a very good thing. He argues that the nuclear discussion is a distraction from a much better solution: an all-in effort to expand wind and solar — and a few other sources of renewable energy. "It's cleaner to go wind and solar," he says. "You can put it up faster. There's a larger abundance of it. There's the potential to power the world many times over. And the costs are coming down — whereas nuclear costs are going up." Nuclear plants take a decade or two to plan and build, so Jacobson doesn't see nuclear as a speedy solution at all. And, he says, there are problems of scale. "If you wanted to power the entire world on nuclear, you'd need about 17,000 large nuclear power plants, each 850 megawatts," Jacobson says. "And we only have 400 today." Jacobson authored a study that charts a path to a future that relies 100 percent on renewable energy. There are about a dozen studies that conclude that would be possible. But, there are other studies — like Jane Long's — arguing the opposite. Jacobson has no doubt about his conclusions. "I'm absolutely sure we can do it," he says. "It's a question of whether we want to do it and whether we will do it." Armond Cohen says nobody should be that confident about what it would take to convert the world to clean energy supplies. A future that relies only on renewable sources of energy, "may be possible," he says, "but it's not something you want to bet the planet on." Cohen acknowledges the risk of a nuclear accident, and the dangers of the proliferation of nuclear weapons. But he's also looking ahead to a world likely to be transformed by global warming, over the course of this century — possibly catastrophically. "Unfortunately we're in a world of 'choose your poison,' " Cohen says. There's some logic to hedging our bets by building new nuclear reactors now, he says. In fact, China has 30 units under construction including some advanced Westinghouse models. And he says there's logic to pressing forward on a new generation of reactors with more safety features. "I can tell you it wasn't easy for me — who, as a lawyer back in the '80s, started my career fighting nuclear power — to come around to the view that it actually may be one of the things in the portfolio that may be necessary to save us," Cohen says. "But that's where the facts lead you." In the end, the biggest issue is not trying to decide how much nuclear energy needs to be in the mix. The biggest issue, Cohen and Jacobson agree, is motivating governments to take on the enormous challenge of phasing out cheap and abundant fossil fuels — and building a cleaner energy supply for the planet.